Once sod is removed, the higher ground must always be brought down to match the height of the lowest grade level within the un-sod area. Dig out the high side! The only exception which would allow for a lower area to be raised up is if you supply a method for retaining the build up of the loose fill and properly compact the fill areas with machinery. Hand tamping of raised fill areas will not be sufficient to prevent settling of the pool frame due to the tons of water soon to be on the area. At your expense and discretion, use of a dense, heavy, drainable, and compactable material (such as crushed stone or stone dust) can be used as a sub-base fill in these situations where ground conditions warrant its use. It must be retained around the perimeter, either by using the excavated sod material as a berm mound or with retainer wall structures, also at your expense and discretion. Due to the extreme weight of the water on the ground, there exists an outward reaching pressure dispersal "cone" or "pyramid" that extends downward through the ground which provides the needed support for the immense weight of the water above the ground. This weight is dispersed at approximately 45 degree angles from the sides of the pool wall structure downward and into the adjacent soil below. Too sharp a drop off when building up a low area will result in that side giving way to the pressure being exerted on it. 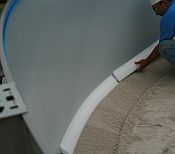 The pool will settle or sink noticeably to that side of the installation over time. The minimum safe distance away from the pool wall you need to be in order to adequately retain the raised fill is dependent upon the height of the fill and its composition, the type of material used as fill, and the slope of the ground adjacent to the pool site and raised area. All of these things make it difficult to recommend the action of raising a site rather than digging it out. There is a risk involved! Your pool is relying on you to use your best judgment given the site conditions you will encounter. We advise you to consult with your town construction zoning officials, professionals, and installation contractors when planning such work. This information has been provided with the intention of making these critical concerns aware to all involved in the construction of all brands of above ground swimming pools. Just as important to leveling the pool site is completely countersinking each post support block into the "virgin soil" or the fully retained dense sub base material. This is especially true when blocks are located on raised fill in order to avoid erosion and washout later. All manufacturer's instructions call for the use of full sized patio stones or blocks as levelers beneath the pool frame posts and buttresses. Jagged half blocks tend to induce settling. 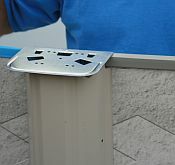 Only the top of the patio block should be exposed and visible after you have completed setting the block in place. Leaving block sides exposed leads to erosion from under pool. All blocks should be leveled side to side and from front to back to ensure that the base plates, track, and pool frame rest firmly and evenly on the block. All blocks should also be no more than 1/16" out of level from one block to the next and no more than 1" from one side or end of the pool to the other. Using a site leveling transit, it is possible to set each block at exactly the same level in the ground around the perimeter. What you see through the scope is exactly what you get when taking your measurements. This assumes that the scope is level, so confirm this as you take readings. Out of level, from block to block, leads to out of round or "square". This leads to buckling of the wall above the wall channel, or bottom track, at or behind the upright posts. This is observed when adjoining blocks are only off from one another by 1/8". It is for these reasons that a pool be built upon a solid and secure foundation and be as level as possible. After you determine the actual position in the ground that the block needs to be placed, be sure all posts will rest squarely and evenly on them. Follow the manufacturer's instruction guidelines on when and how many blocks need to be positioned. Keep checking and re-checking this critical frame positioning as you lay the block, after you have put up the wall, after you have spread the sand base, after you have beveled the sand cove area, and prior to installing the liner. You can't fail if you build it level, square, and round! Although the frame of a properly installed pool has more pressure exerted against it than it has down on it, the positioning of the posts on the leveling point blocks should still be important to you. You will perceive the positioning upon the block to be a problem, so avoid extra work and take the added time and care to position the frame squarely on each block the first time. The smooth, debris free masonry sand beneath the liner will act as a necessary buffer between the harsh terrain of the pool site and the thin vinyl water tight membrane we call a pool liner. All manufacturer's instruction booklets call for enough material to supply a uniform 2" layer of washed, mason's, or yellow sand or a clean soft sand / clay mixture. You will typically use that which is most convenient to you or your area. A good base will help to absorb rock, stone, animal, insect, or root movement caused by nature or seasonal freeze / thaw ground conditions that occur in many parts of the country. After the bottom track is in place and the wall is up, you should place a nut grass killer liberally on top of the sand, wet it down thoroughly and then tamp the sand firmly beginning at the outside edge of the pool and working your ways towards the middle of the pool. Again, level and round your walls, and you're halfway there! The most crucial aspect to wall assembly is to continually check and re-check that the pool is perfectly round or "square" if it is an oval pool. This is to ensure that the pool posts will not lean in or out noticeably as well as to make sure that the liner will fit properly. 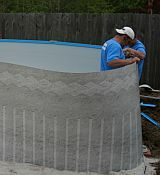 If a pool is out of round, the liner will be stretched in ways it was not intended to be, and wrinkles will form that can not be removed because they are caused by the stretching of the material itself. Dishing the bottom of your pool also causes these wrinkles and is another reason to be sure your pool is perfectly in round. The wall simply gets set in place, into the track, as you slowly unwind the wall around the perimeter of the pool. Many hands make this a much easier task. Having assistance will also help prevent the wind from blowing the wall down. With this base material, you must also build around the inside perimeter of your pool wall an even height, uniform beveled cove to avoid contact between the edges and parts of the metal pool framework and the thin water tight membrane or pool liner. Bevel the sand at a 45 degree angle with the top of the cove a minimum of 6" high, as measured from the base of the pool wall and framework to the top of the angled cove. Pack the sand with a 2 liter bottle pre-filled with water to help form the cove. Taper the cove material downward and inward and blend it into the deep layer of base material that you have laid down previously on top of the undisturbed soil of the site. Visually, you will notice when effort is given or not given to this step of the installation. This base material as well as the cove area should be tamped as firmly and as evenly as possible to minimize the occurrence of large depressions from walking around inside the pool during the liner installation process. A permanent Styrofoam Pool Cove material is an available option if you desire to use it. 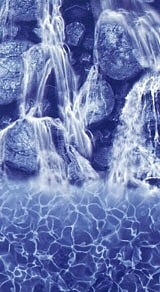 Pool Coves come in Peel & Stick and Clip & Stick varieties. The expectation today is for an installation that is as wrinkle free as possible, but you can not overly stress a liner in an attempt to accomplish this feat of having absolutely no wrinkles. Some wrinkling is to be expected and is considered normal and an acceptable standard. Massive amounts of fold over wrinkles are not acceptable as they are not good for liners. Simply give it your best effort. To avoid wrinkles with overlap liners, remove excess material as water is added. With beaded liners, smooth the material out to the sides. Proper fit and installation of a liner requires patience and diligence on your behalf. The "finished landscaping" will no doubt take time to complete. The even dispersal of the excavated site material after the pool construction is next. 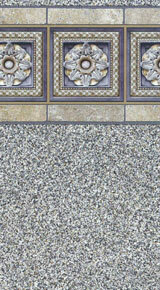 Use this material to even out an area of your yard; most sites have at least one spot that could use some fill. When you obtain your permit for the pool, display it properly prior to starting construction. Be sure the pool location is in accord with zoning rules. Be sure to take care to avoid underground pipes and wires. Codes apply to overhead wires as well. Review your site plans against these restrictions. You must also arrange for the proper wiring of the pool pump. Provision of a dedicated 120 volt power line run underground, according to code requirements, from the main source power panel or sub-panel off, a 20 or 30 amp G.F.C.I. protected breaker. It should be wired directly to the pump, using the proper wire size for the length of wire run from the main power source to the pump, in order to carry the required electrical load. Additional outlets may be required near the pool but not closer than 10' (check codes). A special child-proof, twist-lock receptacle for the pump to plug into. An outdoor weatherproof junction box. Proper bonding of the motor and pool frame and ladder per local electrical code. You are now the proud owner of lots of empty cartons, packaging materials, as well as a great new pool. Break down all cartons and arrange them neatly for ease of pick up by your local trash or recycling service. The above is intended as a Guide only and not the actual instructions for installing your above ground pool. 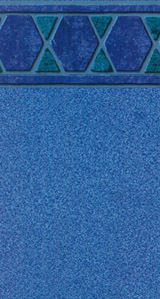 Please read and follow the manufacturer's instructions as it pertains to your above ground pools' special requirements. Call today and schedule your above ground pool OR liner only installation!